USDA Natural Resources Conservation Service (NRCS) is adding 11 new projects to Working Lands for Wildlife, the agency's effort to help producers restore and protect habitat for declining species on farms, ranches, and working forests. NRCS provides technical and financial assistance to help producers adopt conservation practices on their land. 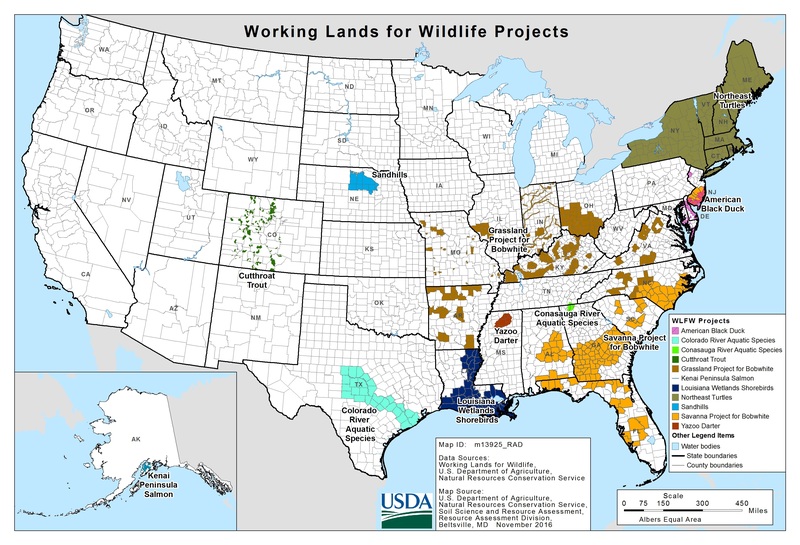 A map showing the new project species and areas is available online. USDA Agricultural Marketing Service has published final guidance on the Classification of Materials and a list of Materials for Organic Crop Production. The guidance on classification clarifies practices used to classify materials as synthetic or nonsynthetic and as agricultural or nonagricultural. The list of materials includes tools to help organic producers understand which input materials are allowed, as well as a list of materials that are specifically prohibited. Practical Farmers of Iowa has released a four-page report titled Economic Benefits from Utilizing Cover Crops as Forage. Early results of an ongoing research project indicate that planting and grazing cover crops is a practical way to effectively reduce nutrient pollution, plus provide economic benefits. The four cooperating farmers reported that grazing cover crops in 2015 saved them $1,306 to $22,801 in hay and stored-feed costs. Sustainable Agriculture Research & Education (SARE) has released Systems Research for Agriculture, a handbook that provides the theories and tools that researchers and producers need to design and conduct interdisciplinary systems research projects that advance sustainable agroecosystems. This handbook introduces agricultural systems research and delivers guidance on how to form effective interdisciplinary and multi-stakeholder teams, and how to plan, implement, and analyze systems experiments. USDA will accept more than 2,100 offers for the CRP Grasslands program, totaling more than 504,000 acres. Through this program, grasslands threatened by development or conversion to row crops are maintained as livestock grazing areas, while providing important conservation benefits. USDA is still accepting offers for CRP Grasslands. The current ranking period that closes on December 16 includes a new practice specifically tailored for small-scale livestock grazing operations. The United States Lamb Resource Center has posted a series of PDF fact sheets identifying best practices for U.S. producers to increase their lamb crops. Twelve Productivity Best Practices were identified and a detailed online fact sheet developed for each. Titles include Select for Productive Genetics, Optimal Nutrition, Match Reproduction to Management, Cull Underperforming Ewes, and Disease Prevention and Treatment. The Agricultural Safety and Health Council of America (ASHCA) is seeking applications for the 2017 Safety Grants. Grants may be awarded for practical safety research, development of safety programs, research to study causes or interventions in specific agricultural settings, or development of education or communication programs, as well as for professional-development programs targeting both agricultural producers/businesses and agricultural-safety and health professionals. A letter of intent is due December 15, 2016; full applications are due January 4, 2017. USDA Natural Resources Conservation Service in Maine is accepting applications for Conservation Innovation Grants up to $75,000. Proposals are requested from eligible governmental or non-governmental organizations, or individuals, for projects between one and three years in duration. NRCS will consider proposals in the areas of Integrated Pest Management, Energy Efficiency, Soil Health, Wildlife, and Conservation Planning and Practices. Proposals must be received by February 15, 2017. Maryland Energy Administration is accepting applications from Maryland agricultural businesses for competitive grants to cover up to 50% of the cost of eligible energy-efficiency upgrades and up to 25% of the cost of eligible renewable-energy upgrades, after all other incentives have been applied. Up to $650,000 is available for eligible energy-efficiency measures and up to $250,000 for eligible renewable-energy measures. Applications are due December 15, 2016. Attendees will learn from their farming peers about different approaches to conserving money and soil, growing and marketing a range of crops, keeping good-quality financial and production records, accessing land and capital, and more. The theme is "Turning Grass into CA$H: Opportunities in Grassland Agriculture." Workshops on cattle and sheep production, marketing, soil health, and grazing techniques feature panels of university scientists and producers. There will also be poster presentations. Northeast Organic Farming Association (NOFA) of New York's 35th Annual Winter Conference will feature 17 tracks, a seed conference, a seed swap, and more. This event will also play host to the Northeast Organic Seed Conference: Owning Our Seed. What can you tell me about growing hot peppers, such as the Scotch bonnet, in Florida? In this free webinar on December 14, 2016, NCAT agricultural specialists will introduce crop planning for vegetable growers wanting to scale up into wholesale or institutional markets.